Opgal, since 1983, has provided one of the broadest product lines of innovative thermal imaging and near-infrared illumination camera solutions. The breadth and depth of this product line establishes Opgal as a leading player in the complex and wide-ranging defense, security, industrial, and aviation markets. In the Security market, Opgal enables transportation, city and state governments, industrial, and utility customers to detect, recognize, and identify security threats 24/7 even in complete darkness and difficult visibility conditions. A market leader in the Defense industry, Opgal is known for working closely with customers to deliver custom made solutions that address specific needs. For the Industrial industry, Opgal developed the only gas leak detection camera of its kind in the world that has been certified for use in sensitive and hazardous locations according to American and European standards (ATEX, CSA, UL). The company was also the first to provide an FAA-approved landing assist and situational awareness system for the avionic industry. Decades of research and development have been invested in state-of-the art and unmatched image-processing capabilities. Opgal’s technology, based on exploiting minute levels of energy to produce meaningful video data, goes far beyond standard image quality. Opgal’s products facilitate the detailed insight required to make the correct assessment of a situation and take appropriate action. Backed by years of success, Opgal is a global company with customers in over 50 countries. Detect and identify threats and targets with state of the art advanced weapon sights. Improve firing accuracy and enable soldiers to effectively use their weapons in multiple combat environments while minimizing the risk to noncombatant and friendly forces. Delivering an innovative solution for long range observation and situational awareness, Opgal’s Arbel HS thermal camera is equipped with a dual field of view lens providing wide (14.3˚) and narrow (4.6˚) field of view while retaining line of sight on the target. EyeLite 640 is used in remote controlled weapon stations (RCWS) and can be integrated into gimbals, pan-tilt observation stations and other fixed or mobile platforms. It is equipped with a continuous zoom telescope to maintain line of sight with the target. The Golan thermal camera is ruggedized to withstand the harshest weather and environmental conditions, including rain, direct sunlight, high humidity, dust, shocks and vibrations. It can be used stand-alone and/or as an OEM sensor to be integrated in the customer’s surveillance or weapon sight systems. Opgal’s Hurricane is a cost-effective electro-optical sight for medium and long-range observation and weapon stations. The system configuration consists of a thermal video channel, a visible channel, and an optional laser range finder (LRF) device. Opgal's Driver Vision Enhancer and Local Situational Awareness systems increase the security and safety of a vehicle’s crew by enabling the driver and other crew members to visualize the local scenery on a display in real-time and identify potential threats and obstacles. Opgal’s line of DVE and LSA products and solutions allows users to see road hazards clearly in total darkness, detecting and alerting them to threats, obstacles, and targets of interest. The Tavor BS DVE kit is a state of the art thermal imaging camera with a variety of wide viewing angles (up to 180° horizontal FOV) available in an off-the-shelf modular kit. Tavor™ BS is a Driver Viewer Enhancer (DVE) solution enabling situational awareness and driving in complete darkness or difficult visibility conditions. Tavor SA is a state of the art dual sensor DVE thermal imaging camera based on Opgal’s® market leading image processing capabilities. The Tavor SM camera is a situational awareness solution which enables driving 24/7 in complete darkness and difficult visibility conditions. The Tavor 180° kits consist of a suite of day, and thermal Tavor SM cameras mounted on the sides, front, and back of the armored vehicle to give 180° of clear thermal imaging and SA, any time of day or night. With decades of experience and a proven record of systems innovation, Opgal’s OEM thermal solutions for military applications allow you to harness the power of thermal imaging for all defense needs. The company's customizable solutions for armored vehicle upgrades offer improved survivability and situational awareness in today’s modern battlefield environments. Opgal's commander sight kit upgrade provides enhanced vision capabilities for peri-telescopes and gives armored vehicle crews the ability to reconnoiter, identify, and tag targets at greater distances and at close range, 24/7 and under limited visibility conditions such as dust, fog, and rain. Opgal's gunner sight upgrades give gunners increased visual range for identification and acquisition of targets, and a clearer view in situations of limited visibility. They are also an extremely cost effective solution for providing vision capabilities to vehicles with end of life cooled thermal channels. Opgal is the largest global provider of thermal engines to both integrators and end users with close to 60,000 units in the field. Opgal has used its vast customer experience to address specific application requirements such as ultra-low power consumption, very low voltage input, extremely short time to image, and built-in digital video output. Opgal’s next generation 17μm microbolometer thermal imaging engine platform is especially designed for better, smaller, cheaper integration by OEM clients who need VGA resolution. The EyeR Core HS is specifically designed for OEM thermal imaging solutions. Its design is adaptable, modular, and flexible enabling easy customization. Its modular mechanical design allows maximum flexibility to fit the customer’s product. EyeR Core NV (VGA, ASi) is an advanced, versatile, modular platform that supports an ASi microbolometer detector, including 17μ detector technology. For ultimate security day or night, Opgal’s suite of thermal cameras provides unmatched thermal imaging and detection. Giving 24/7 surveillance capabilities, Opgal's customizable security solutions provide clear, high contrast video even in extreme weather conditions, allowing customers to protect their most valuable assets, and respond quickly to any intrusion. The Sii AT is a 24/7 outdoor security thermal camera used for observing and monitoring sensitive sites. The Sii ML is a 24/7 outdoor security thermal camera used for observing and monitoring sensitive sites. The Sii XR is designed to meet a variety of long range security and surveillance needs, and meets maritime and industrial specifications. Sii XRU is available as a standalone long range thermal camera package that is easy to integrate with other systems. The new Sii™ OP is our most state of the art detection system to date, boasting an incredibly easy installation with day and night capabilities and a dedicated SDK for full seamless 3rd party integration. Designed to provide maximum situational awareness and 24/7 threat assessment, Opgal’s user friendly dual channel systems help customers to protect their most valuable assets. With options like HD day cameras, ruggedized systems, and low maintenance long range or high sensitivity ultra-long range surveillance, Opgal’s multi-camera PTZ systems are excellent security solutions for a whole range of requirements and budgets. 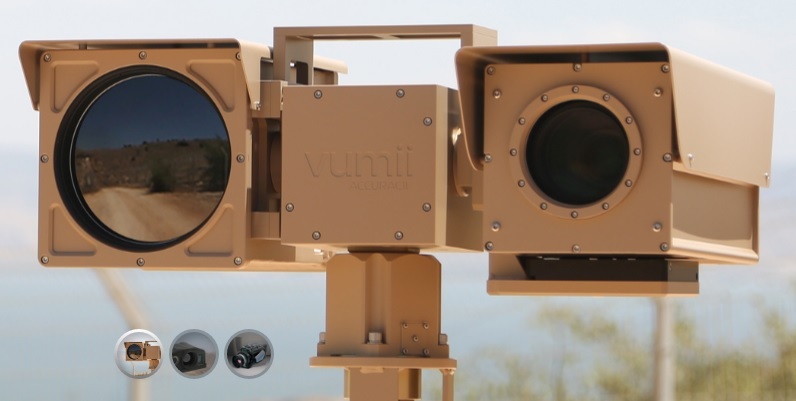 Vumii’s Accuracii AT Mini is a compact and lightweight system, which combines two advanced video channels on an integrated continuous 360° pan, +/- 90° tilt positioner to deliver 24/7 covert security. Accuracii AT Mini HD provides effective covert security, combining thermal and Full HD CMOS channels on an integrated continuous 360° pan, +/- 90° tilt positioner to deliver high quality video 24/7. Accuracii AT is a powerful multi-sensor PTZ observation system developed for security applications. The Accuracii ML is a powerful day and night, multi-sensor observation system especially developed for security applications. The Accuracii XRU is a market-leading long-range dual-sensor surveillance system. This unique system combines an advanced high-resolution uncooled thermal continuous zoom camera with a mid- or long range visible-light camera on a PTZ unit. Whether a fire fighter, a law enforcement officer, or a member of a search and rescue team, handheld thermal surveillance devices provide a tactical advantage in the field, offering clear images in total darkness. Delivering mission-critical information which can save lives, these rugged and portable systems reveal the location of victims and suspects alike. The Sii HB handheld thermal binocular with 75mm lens (HHTI 75) provides night vision capability for surveillance, perimeter security, search and rescue, and other applications on land or at sea. Sii HM delivers high-resolution nighttime vision capabilities, enabling enabling human target detection up to 1,000 meters and vehicle detection up to 2,500 meters. The Sii WS thermal weapon sight provides night vision capabilities for security, law enforcement, and hunting, and is designed to increase accuracy and effectiveness, enhancing the safety of security personnel during operations. Therm-App improves effectiveness in the field, providing clear images in total darkness – delivering mission critical information which can save lives. The compact and lightweight camera with interchangeable lenses enables users to record and immediately share high-quality thermal images and videos. Connecting to most Android devices, it offers superb image quality and low power consumption. The innovative Therm-App® TH transforms your Android device into a professional, highly capable, and constantly evolving thermographic tool. Utilizing near-infrared technology, Opgal provides laser and infrared based illumination products. These powerful cameras enable detailed human assessment in complete darkness or daylight at long ranges. People and faces are easily identifiable, and text and numbers can be read even through glass, even in complete darkness. Claritii is the latest LED enhanced near infrared camera imaging solution for outdoor perimeter and border protection. The Discoverii near IR camera systems leverage the power of directed covert (laser) energy to see incredible details during the day or in absolute darkness at night. Opgal’s open frame cameras are comprised of a thermal engine, thermal lens, open frame enclosure and engine mount plate. The cameras are available with a wide variety of athermalized and continuous zoom optics, as well as dual field-of-view lenses for high-resolution analog, digital, or camera link video output. Suitable for a broad range of applications, Opgal’s OFCs operate in a wide temperature range with low power consumption. Sii MLO is designed to withstand the harshest weather and environmental conditions, including rain, direct sunlight, high humidity and dust. It is used in a variety of security applications such as observation and detection. Suitable for a broad range of applications, Opgal’s® OFCs operate in a wide temperature range with low power consumption. Opgal was the first to develop and market an innovative landing-assist and situational awareness thermal-imaging camera for an EVS (Enhanced Vision System). Opgal is also by far the largest manufacturer of EVS cameras with landing credit. Installed as a standard feature in many airplanes, EVS systems facilitate precision approaches and safe landings 24/7 in reduced visibility conditions including thick fog, smog, heavy rain, and snow. As an added benefit, EVS-trained crews are permitted to descend below published minimums before visually detecting the runway or approach lights, due to the overwhelming safety benefits of EVS. Opgal’s EVS AP camera is a field proven, highly sensitive, wide-spectrum infrared camera that provides commercial and business aircraft pilots with clear Head-Up Display (HUD) video images of the runway environment enabling safe taxiing, takeoff, precision approach, and landing. Opgal’s proprietary Everest EVS system leads the new wave of EVS multisensor systems. Designed by Opgal based on 17 years of EVS experience, Everest EVS delivers crisp images of incandescent and LED runway lighting, day or night, in poor lighting or harsh weather conditions. EVS significantly improves flight safety and situational awareness, in the air, and on active taxiways and runways, enabling safe taxiing, takeoff, precision approach, and landing. Optical gas imaging (OGI) is an innovative thermal imaging technology that utilizes high sensitivity infrared cameras for detecting very small fugitive emissions of industrial gases. OGI cameras enable the quick and safe detection and visualization of fugitive emissions leaks, allowing users to quickly detect and repair leaks, prevent major damage, and avoid fines. These cameras have been used globally for the past decade, and are now recognized by regulators as the best system for emissions reduction. EyeCGas®, Opgal’s line of innovative OGI cameras, was specifically designed for detecting gas leaks in the harsh conditions of the oil & gas industry. It is the only OGI camera that is certified for ATEX zone 2 and UL class I Div II, hazardous environments. EyeCGas, Opgal’s line of OGI cameras, offers solutions for various types of gases, in both handheld and stationary product configurations. EyeCGas is a handheld OGI camera for the detection of fugitive gas emissions for over 30 hydrocarbon and VOC gases, including Methane, Benzene, and Hexane. EyeCGas complies with the EPA’s “Quad Oa” (OOOOa) regulations and is used globally across the industry for LDAR compliance. EyeCGas CO2 is a handheld OGI camera for CO2 gas leak detection. With the EyeCGas CO2 camera, you can safely and remotely detect and locate very small concentrations of carbon dioxide emissions either when used as a tracer gas for finding leaks, for monitoring various industrial processes, or for enhanced oil recovery (EOR) operations. EyeCGas FX is a family of solutions for automated continuous gas leak detection. EyeCGas FX cameras are designed to operate 24/7 in oil & gas hazardous locations. They are configured for continuous monitoring for hydrocarbon and VOC gas leaks, and to automatically report leaks to the control room through a dedicated software system. Opgal’s® battle proven defense solutions conform to the strictest military standards for deployment on land, sea, and air. Opgal offers thermal-imaging solutions for both OEM applications and end users, ranging from thermal cores to completely integrated thermal-imaging cameras, systems, and subsystems. Opgal’s technology is based on an open architecture, which makes it suitable for applications such as thermal scopes, weapon sights and stations, gimbals, UAVs, naval observation, IR sensors, and driver vehicle enhancers (DVEs) for tanks and military vehicles. Opgal partners with end users to develop customized solutions that address specific military and defense objectives. Thermal imaging solutions for the modernization & enhancement of armored vehicle operational capabilities. Vision enhancers that provide & maintain clear sight day or night, & that can greatly increase your crews survivability. Night & bad weather driving are no match for these thermal cameras that provide wide FOV's & enhanced LSA. Highly sensitive long range thermal imaging systems help you ID targets & respond to threats from great distances. Opgal's customizable solutions help keep vision systems up to date & military vehicles on the road, enhancing & improving their crews operability. Securing a site or city requires the ability to distinguish between friend and foe, and in today’s world, that means 24/7 video surveillance. With today’s high powered thermal imaging cameras providing unprecedented situational awareness, security forces can now observe, investigate, and if needed, respond to any situation during the day or at night, even in harsh visibility conditions like rain and fog. Aviation safety is at the core of Opgal’s® aviation solutions, ensuring safe taxiing, takeoff, precision approach, and safe landing in reduced visibility conditions including night, thick fog, smog, heavy rain, and snow. Fusing different IR spectrums and the application of proprietary algorithms allows Opgal® Enhanced Vision System cameras to provide clear images of the terrain, approach and runway lights, runway threshold, buildings, obstructions and aircraft in close proximity. These images, which are normally undetectable “out the window” to the pilot at night and during bad weather, are detected by Opgal’s® EVS cameras and provide the visual cues necessary for safe landing. With more than 35 years of experience in the field of electro-optics, Opgal® is a global producer of ground-breaking IR cameras and thermal imaging systems for industrial applications. Opgal® technology gives the ability see beyond the visible to test, measure, and inspect large areas and identify hidden problems fast, saving valuable resources and increasing productivity across a multitude of industrial applications. Opgal's two product lines for industrial applications include NDTherm, Opgal's active thermography technology for identifying defects in composite materials, and EyeCGas, Opgal's OGI camera for finding fugitive emissions gas leaks. NDTherm is an active thermography solution for the inspection and detection of defects in various industrial applications. EyeCGas is an infrared optical gas imaging (OGI) solution for the safe and fast detection of gas leaks and fugitive emissions even from a distance.